Those people that came downtown during Doors Open Milwaukee last month had a chance to see some old, historic buildings. The age of the buildings was apparent in the layers of dust and dirt and the classic architectural features like mansard roofs, elaborate cornices, carved stonework, and incredible terra cotta ornaments. Some of the buildings that weren’t open were probably given a quick look as they were passed but nothing much stood out to identify the buildings as historic and old. 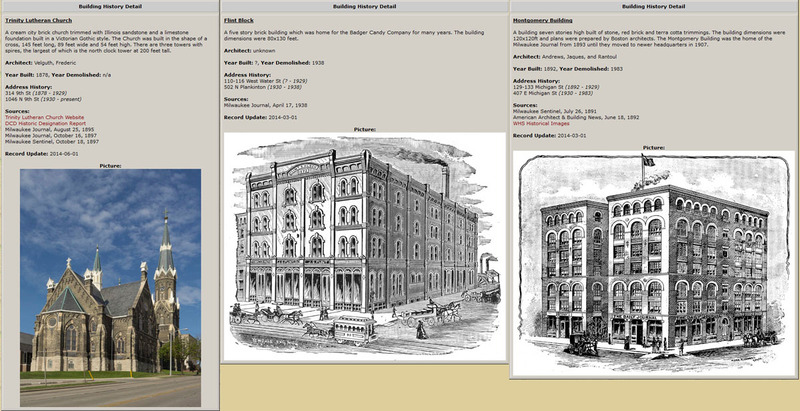 It is surprising to find that a building’s history is much older than it seems. Even when the building looks old, it might be that it is much older. 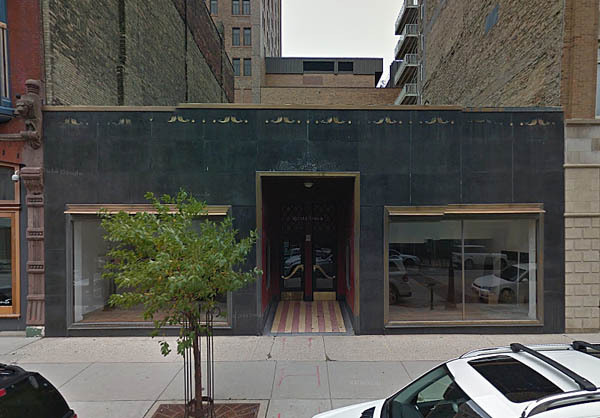 One interesting example is the Lou Fritzel Building located at 733 N. Milwaukee Street. The Fritzel women’s clothing business occupied the building since it was renovated in 1939 until it closed 50 years later in 1989. Since then it has mostly remained vacant and time is starting to take its toll on the empty shell, making it look older than the style of its Moderne facade. In fact the building actually was built in 1877 with an Italianate style common to some neighboring buildings. 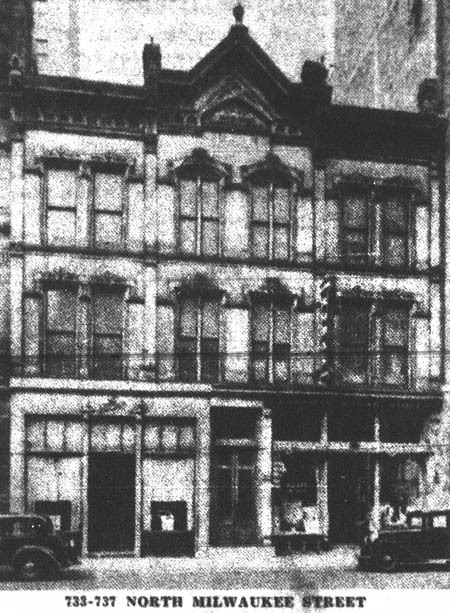 The renovation of 1939 clipped off the top two stories and made the building a one story building that was very modern looking for the street at the time. On the adjacent buildings the ghost silhouette of the original building can still be seen. There really are no visible clues to the real age of the building when seen from the street. 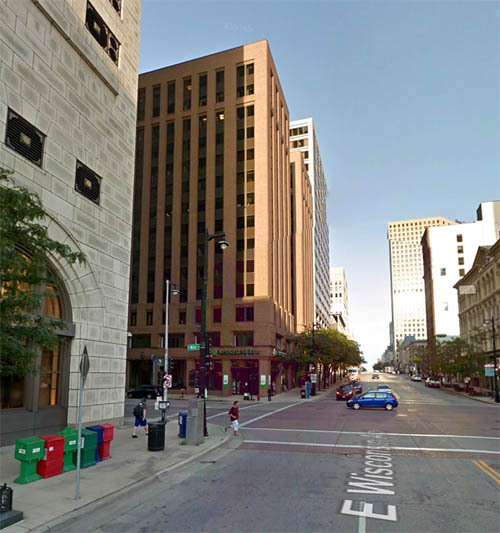 Another nearby building that might seem to be very recent is the 14 story Banker’s Building at the northeast corner of Water and Wisconsin. It was actually built in 1929 by Eschweiler and Eschweiler architects in a stylish neo-classical design similar to many buildings built at that time like the Hilton Hotel at 5th & Wisconsin or the Empire Building at Plankinton & Wisconsin. It originally had a much different exterior with terra cotta banding on the cornice and top floors. The bottom two floors had elaborate terra cotta ornamentation and large plate glass windows with darker brass metalwork. A complete renovation in 1983 removed all of the old brick work and terra cotta to be replaced with a more monochrome, dark red brick. Windows were replaced with modern, dark windows in vertical bands making the building appear very contemporary. A few other buildings exist downtown that have been made over a few times and are extremely different than they once looked. I’ll try to write a future blog post about these other buildings.